We live in a university town that is unique in our region of Idaho. Our local school district has a reputation of performing far above the state in terms of academic performance. Yet, in the last three years, Palouse Prairie Charter school has continually performed better than the district on standardized assessments. In addition, for the academic year, 2016-2017, Palouse Prairie ranked 4th in the state for performance in English Language Arts and 7th in the state for performance in Mathematics. The ranking includes all 798 public schools in the State of Idaho, and is based on the proficiency levels of our state standardized assessment. 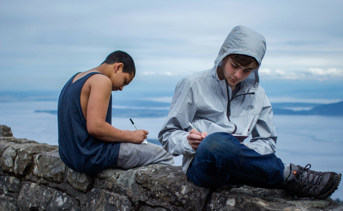 We are proud of our academic performance, but perhaps more compelling is our ability to outperform our neighbors academically while also making joyful learning and adventure experiences a priority. Since the 2014-2015 school year, our school has used the Idaho State Achievement Test as the annual statewide testing tool for 3rd-8th graders. This assessment is aligned with the national SBAC Assessment, though it is administered through the Idaho State Department of Education. Students take the ISAT Assessment each spring from 3rd-8th grade in Math and English Language Arts. In addition, students take the Science Assessment in 5th and 7th grade. Our academic achievement in Science is specifically addressed in our third Mastery of Knowledge and Skills claim. Since 2010, our youngest learners have taken the Idaho Reading Indicator Assessment, IRI. This assessment is not Common Core Aligned, and is in the process of being revised by the state to be more predictive of academic success. We use the IRI to help us monitor the growth and academic success of our K-3 emerging readers. Our first piece of evidence is from The Idaho State Education Trends 2018 Annual Report. Each year, this organization prepares a report that summarizes the current trends in Education in the state of Idaho. This year, our school was ranked 4th in ELA and 7th in Mathematics achievement. We are the only school in Moscow that is ranked as the top in the state. In ELA, 76.5% of our students were either proficient or advanced on the ISAT. In Math, 68.2% of our students were either proficient or advanced on the ISAT. Our school has worked tirelessly to prepare our students academically to have the critical thinking and problem solving skills to be successful learners, and this work is reflected in our students’ ability to transfer their understanding in the classroom to the prompts and problems on our annual standardized assessment. 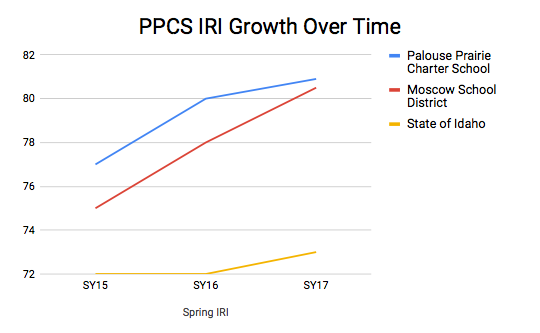 This data trend is true when we compare ourselves to other schools in the state, and remains true when we look at our performance compared to Moscow district schools. Our local community supports three elementary schools, a K-8 charter school chartered by the district and a 6-8 Middle School. Notice that we are more than 5% higher in proficiency than the highest performing schools in Moscow. While we are particularly proud of our students’ academic performance in the 2016-2107 school year, our trend of excelling academically extends back to the 2014-2015 school year, the first year that the Common Core aligned ISAT 2.0 tool was used as the statewide annual assessment tool. 2014-2015 also marked a year of specific attention to the instructional practices that promote higher levels of conceptual understanding. By focusing on developing lessons that focus on a single idea or strategy and using lesson plan frameworks that support this, we ensure that we are truly teaching the standards in deep and meaningful ways. 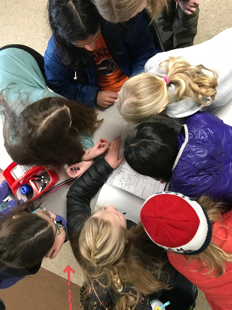 Our school’s attention to a culture of literacy and mathematics across grade levels has also supported students, as they believe themselves to be writers, readers and mathematicians and have the agency to engage in rigorous work within these disciplines, and across disciplines. These figures show our proficiency in the ISAT 2.0 across the last three academic years. While we consistently outperform the state by 15-20 percentage points, our small school is not immune to the data variability that comes with small class sizes and ever-changing student populations. This is especially true during the 2015-2016 school year. 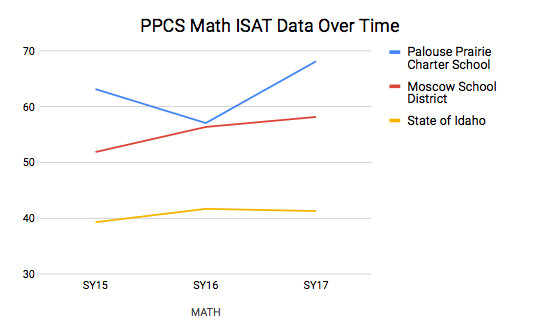 Our ISAT data support our claim that our 3rd-8th graders outperform our district and the state in ways that show our mastery of knowledge and skills. This is true for our youngest learners as well. The IRI measures students’ proficiency in several literacy skills such as recognizing letter names and sounds and reading passages fluently. 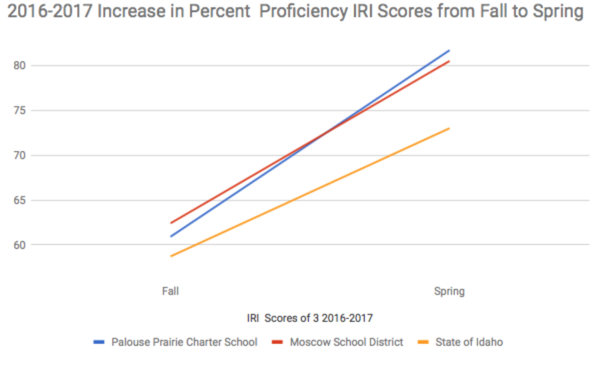 The graph below shows the percent proficient (scoring a 3) on the IRI for the State of Idaho, the Moscow School District, and Palouse Prairie School over the last three academic years. 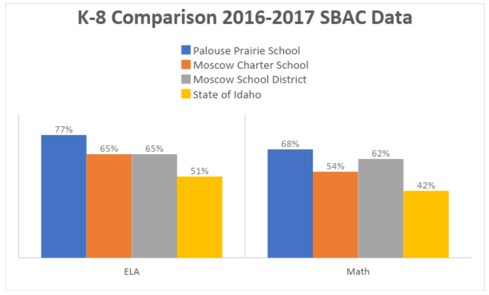 Similar to the ISAT, both PPCS and the Moscow School District perform well above the state of Idaho. And, also similar to the ISAT, our young learners outperform the district and state in a snapshot of last year. 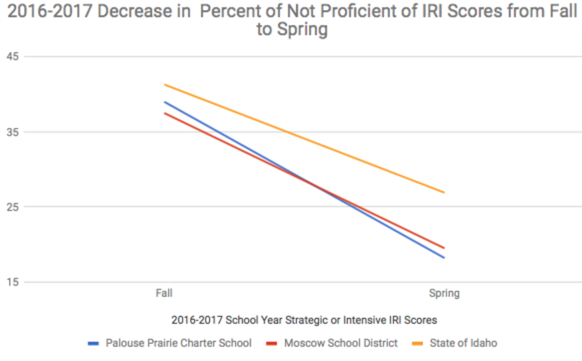 While we started the year with a slightly smaller percent proficient than the Moscow School District (62.4% MSD and 60.9% PPCS), by the Spring IRI assessment, our students outgrew their peers at the district. Again, our district is high performing compared to the state, and our students are outperforming and outgrowing our district neighbors. This graph shows our growth rate on the IRI from Fall to Spring during the 2016-2017 academic year. Our students show more growth over an academic year than the district or the state. This graph shows the decrease from Fall to Spring in the percent of students that are not meeting the IRI benchmarks set by the state of Idaho. We are decreasing at a faster rate than the district or the state, which translates into greater academic growth for our students. We are incredibly proud of our student achievement on rigorous assessments. However, we feel that this accomplishment is made more meaningful by the fact that our students are able to do high level academic work while also experiencing the world beyond core academic subjects. Our students find joy in their learning. Joyful learning means that students are enjoying themselves, having fun, and getting lost in their learning. It means students WANT to come to school and they are engaged in their learning. 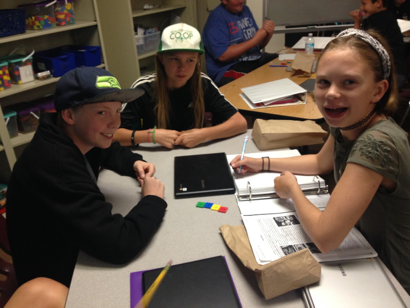 It means that students have novel and community based learning experiences that make their study topics come alive. In our school culture survey, we ask students if they enjoy coming to school. 90% of our students responded that they enjoy being at school, most of the time or all the time. Another way to measure the joy in our learning is to examine the amount of time our students spend outside of the classroom or with experts. 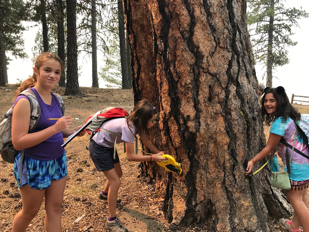 Field work and work with experts are essential pieces of every expedition at PPCS, and these days are filled with engaging, hands on learning experiences. Beginning in kindergarten, our students learn how to connect their classroom learning to the community and our region and they do this in meaningful and memorable ways. The table below shows the number of days per school year each grade level engages in exciting, purposeful fieldwork experiences and visits with experts. 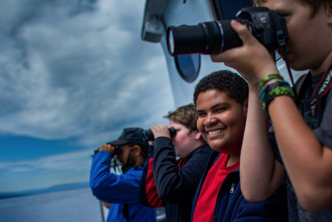 We create joyful learning experiences every day and provide our students many off campus field work days. 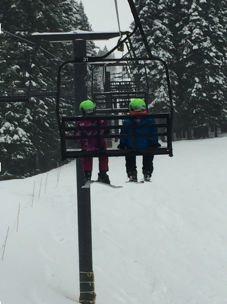 PPCS also highly values outdoor education. We consider adventure to be an essential practice that promotes growth and self-awareness across environments. Beginning in kindergarten, students have opportunities to experience the natural world during Adventure Fridays. 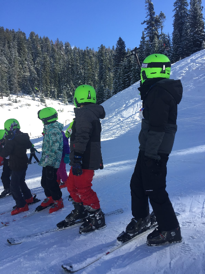 Each year, all students have a Sense of Place Adventure, a winter snowshoe or ski adventure, a winter rock climbing adventure, and a spring biking adventure. Each of these adventures incorporate outdoor education, and the design principles Collaboration and Competition, the Primacy of Self Discovery and the Natural World. These adventures are scaffolded to provide challenging outdoor experiences for students as they grow. 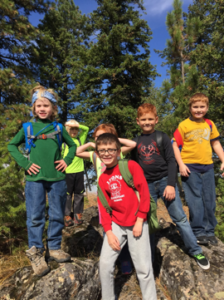 By the time students are in upper elementary school, the adventures also include overnight trips. Below is a table that shows overnight adventure experiences for our 4-8th grade students. PPCS considers these experiences to be an essential part of creating a community of high achieving learners. Our time outside the classroom brings joy and shared experiences to our crews. These experiences support our students in the classroom. 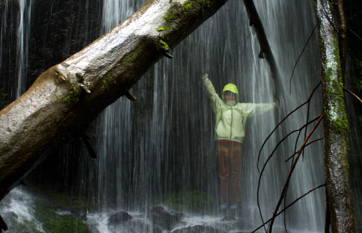 Our students are academically excelling while also spending meaningful time on adventures and overnight experiences. The Moscow School District is in session longer than PPCS and does not have an adventure and outdoor education program. 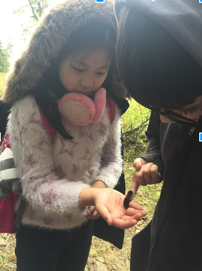 We have shown that we can achieve high levels of academic success while also prioritizing rich, engaging learning experiences and time outside the classroom to explore our world and ourselves. 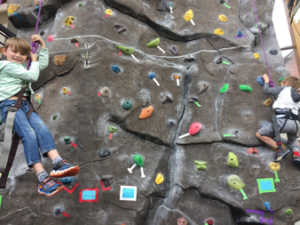 It is our students’ abilities to find joy in their learning and be open to adventures that push them to learn new physical skills that support their learning in the classroom. We have shown that our students outperform the district and state while also balancing rigor, joy and adventure. PPCS 3rd-8th grade students outperform their state and district peers on the rigorous ISAT assessment. PPCS K-3 students outperform their state and district peers on the IRI. PPCS students do this while ALSO prioritizing opportunities for field work, experts, and adventure experiences. We are proud of our students’ abilities to show that they deeply understand the content they are working with and apply their learning and problem solving skills to unfamiliar content. We are equally proud of our students’ willingness to engage in new adventures and find the fun in their learning experience.